Formerly known as the Sparrow Hawk, the American Kestrel is the smallest, most colorful, and most widespread North American falcon. It breeds from Alaska and Canada to Tierra del Fuego, Argentina. It is seen more often than other hawks because in addition to inhabiting wild areas, they frequent towns and agricultural lands, hunting from exposed perches like utility lines along roadsides. The American Kestrel spends the non-breeding season in the southern portion of the breeding range from the Canadian border southward. Description: This small falcon has long pointed wings and a long tail. 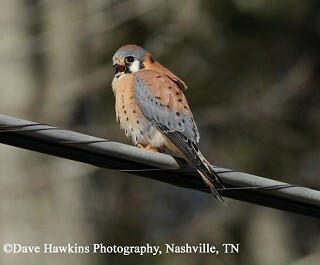 The male American Kestrel is very colorful and one of the most beautiful hawks in North America. The head is brightly patterned with two dark mustache marks on the face and "eye spots" on back of the head. The back and tail are rust colored, and the blue-gray wings and pale chest have black spots. The female is bright brown with black barring on the back and tail. She also has a boldly patterned head but not as colorful as the male's. The female is 10% heavier than the male. Juvenile birds look similar to adults. Merlins are slightly larger, lack rust color on the back, wings, and tail, and lack a well-defined head pattern. They also have a much more powerful and direct flight pattern than American Kestrels. Merlins are an uncommon migrant and rare winter resident in Tennessee. Habitat: Open areas such as croplands, pastures, and along roadsides. Often found near areas of human activity. Diet: American Kestrels eat large insects, small mammals, reptiles, amphibians, and birds. They will sometimes hover several feet above the ground while hunting. Nesting and reproduction: American Kestrels nest in cavities, but they do not excavate their own holes. The availability of cavities may limit the population. Clutch Size: Usually 4 to 5 eggs, with a range of 1 to 7 eggs. Incubation: Both males and females incubate the eggs for 29 to 31 days. Fledging: Young begin hunting shortly after leaving the nest at 30 to 31 days, with the parents continuing to feed them for another 2 weeks. Nest: American Kestrels nest in cavities in trees, buildings, and in nest boxes. No material is added to the nest hole. Nest Box Instructions here. Status in Tennessee: The American Kestrel is a relatively common statewide resident. More northerly nesting birds join Tennessee's resident population from October through April. Populations are generally decreasing rangewide and likely so in Tennessee. "Hover-hunting," often seen along roadsides, is used most often when there are no suitable perches available. The females arrive first on the wintering grounds and establish their territories in the preferred open areas. The males, arriving later are forced to use areas with more trees. The oldest known American Kestrel in the wild was 14 years, 8 months old. Best places to see in Tennessee: Open lands statewide where they perch on roadside telephone poles and power lines.